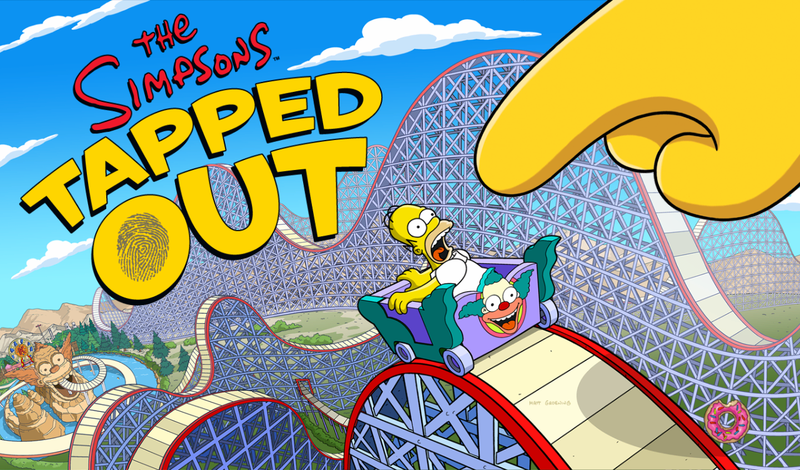 The Simpsons Tapped Out has been updated to version 4.4.0 for iOS and Android users. The update is available through the respective app stores and brings several new features and improvements. 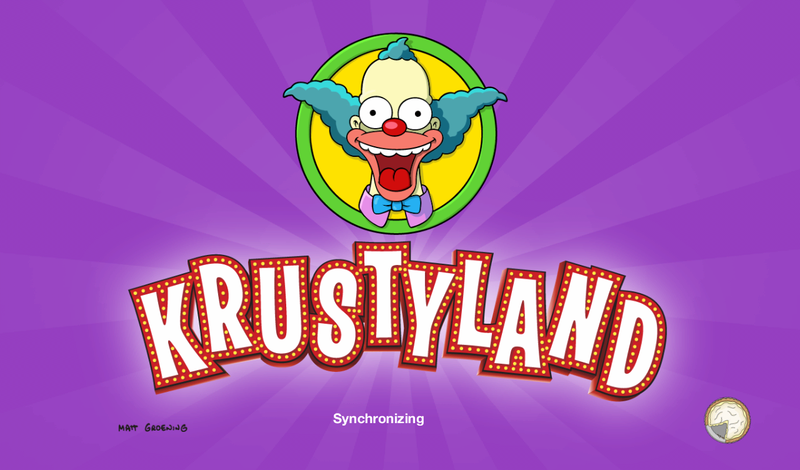 You can bring the Krustyland theme park to life with rides, games, mascots, quests and more. 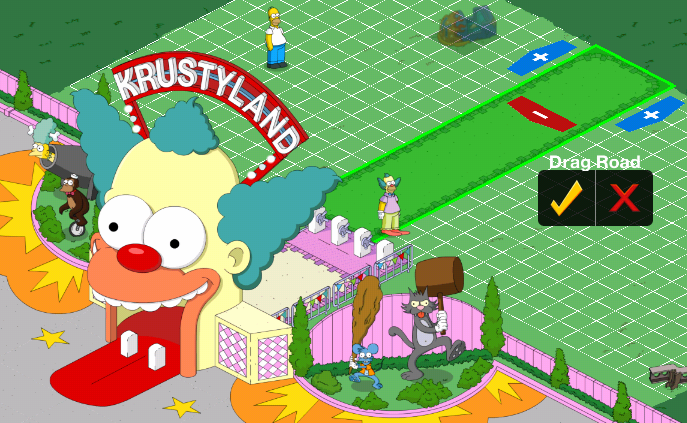 Krustyland is located in an entirely brand new area for your park and raise your Krust-O-Meter to attract more visitors. Krustyland features iconic rides like the Tooth Chipper and Mt. 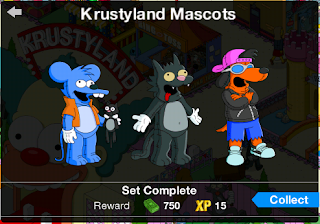 Krustmore, mascots of both Itchy and Scratchy and over 40 other rides and games. Once you have downloaded and installed the update, keep in mind that the game will require to download a few more files before it is ready to load. Lets first take a closer look at whats new with the 4.4.0 Krustyland update. 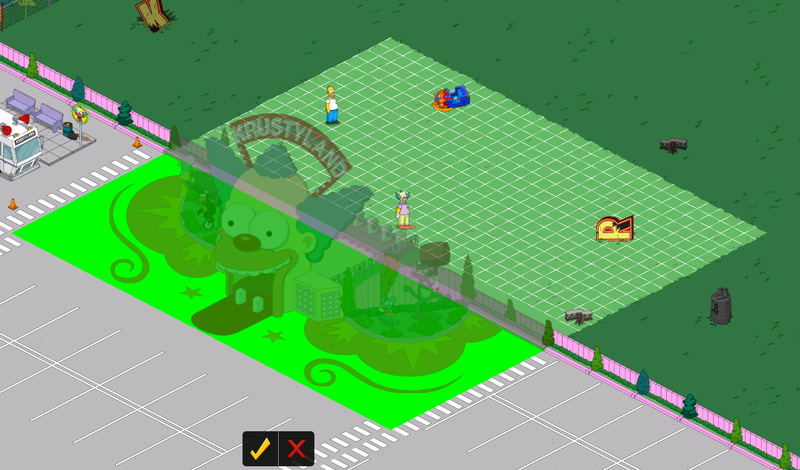 You can visit Krustyland from Springfield by placing the Bus Depot to Krustyland in Springfield. 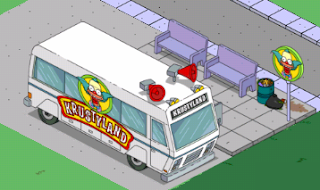 As you increase your Krust-O-Meter in Krustyland, your bus depot is upgraded into a fancier one. 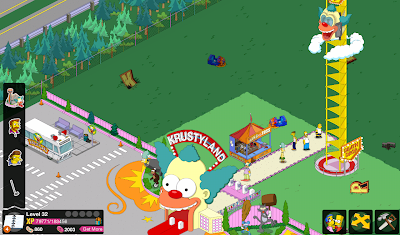 You can then return to Springfield from Krustyland by selecting the Bus Depot again when you are in Krustyland. Krusty is broke in financial debt from spending all his money at the dog tracks. Bart suggests that he reopen Krustyland and make his money back. Krusty is cautious and worries about the "maintainence" (or lack of) involved in owning a theme park. 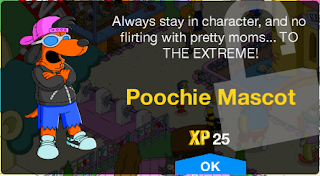 Tapping on the shuttle will show a new loading screen and drop you off outside of Krustyland. Remember that you can click the shuttle at the Krustyland parking lot at any point to return home. You will be awarded 100 and 10 for completing your first mission. The Krusty-est Place on Earth Pt.2 - Krusty is looking for a schmuck to help him clean up the old Krustyland location.. (Now we realize why Homer has come along for this ride) Make Homer cleanup Krustyland [ 12 and 10]. You will be awarded 20 and 10 for completion. Homer is not happy being put to work and complains that the 'girder-dragging' ride at Disneyland is better. Homer also complains about the new currency ( ) which Krusty introduces as Krustyland Tickets. 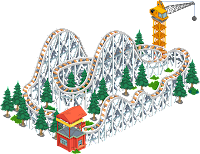 The Krusty-est Place on Earth Pt.3 - Build the Krustyland Entrance for 20. It takes just 6 seconds to complete and you are awarded 20 and 10 for completion. The Krusty-est Place on Earth Pt.4 - Place four Krusty paths. 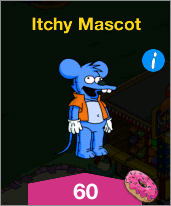 Its the same as placing roads back in Springfield and you are awarded 20 and 10 for completion. The Krusty-est Place on Earth Pt.5 - Place a Ring Toss Stall for 35. You are awarded 20 and 10 for completion. The Krusty-est Place on Earth Pt.6 - Krusty wants Homer to run the Ring Toss Stall, but Homer would rather play. So Krusty will hire Sideshow Mel and Cletus to work at Krustyland, when they are not busy performing tasks in Springfield. Make Homer Play at the Ring Toss Game three times [ 52 and 45]. The tasks take 4 hours each. You are awarded 20 and 10 for completion. You get a message that says Bart, Lisa and Kearney will be able to travel to Krustyland when they are free in Springfield. 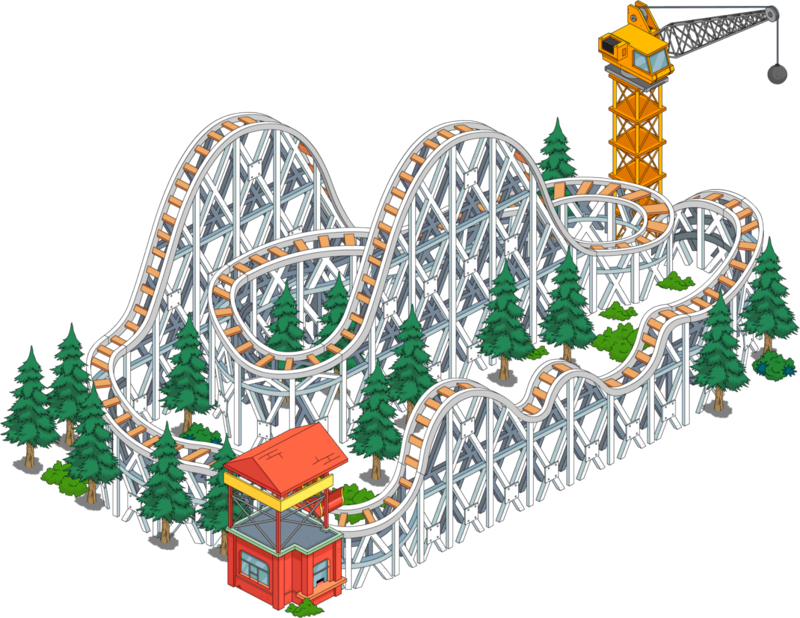 The Krusty-est Place on Earth Pt.7 - Bart wants Krusty to build his favorite ride the 'Death Drop'. Now its up to your to build it for 300. It will take 12 hours to complete and you are awarded 20 and 10 for completion. 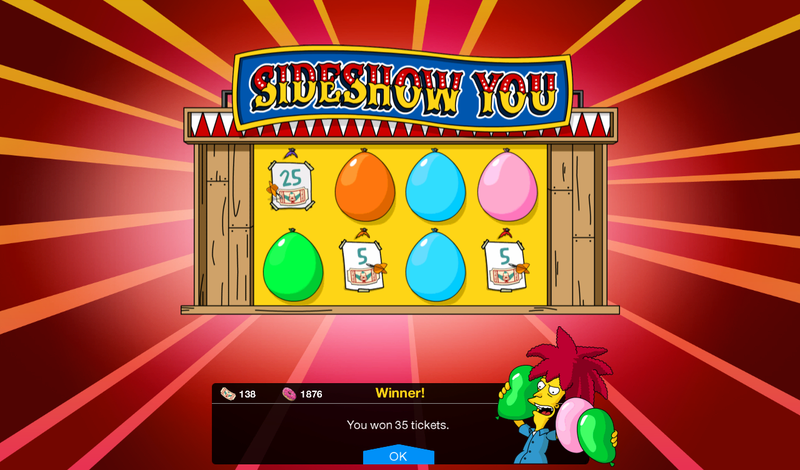 You will also receive a message that Milhouse will be able to travel to Krustyland when they are free in Springfield. The Krusty-est Place on Earth Pt.8 - Bart is eager to ride the Death Drop, but Milhouse is hesitant. He agrees to try it if Lisa holds his hand. Lisa and Milhouse are done with round one, but Bart is ready for one more. You will receive 20 and 10 for completion. Click on Homer to continue. 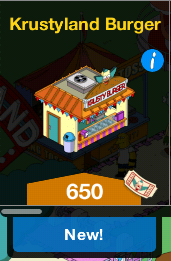 The Krusty-est Place on Earth Pt.9 - Buy a Krustyland Expansion for 250. You will receive 20 and 10 for completion. Homer is hungry and wants something to eat. 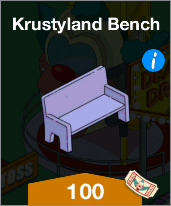 The Krusty-est Place on Earth Pt.10 - Reach level 21 (if you haven't already) and build a Krustyland Burger. It costs 650 to build and will take 24 hours to complete. You will receive 20 and 10 for completion. You will receive 20 and 10 for completion. Click on Bart to continue. You will receive a message that Martin, Skinner and Otto will appear on Krustyland when they are not busy in Springfield. 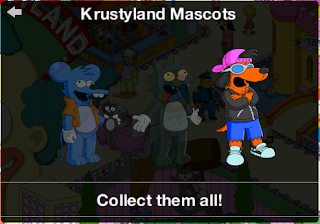 Now that you have several buildings in Krustyland, your Krusty-O-Meter will start increasing and more people will show up at your park. 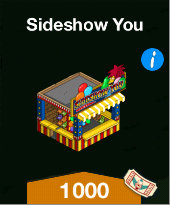 Having people in your park will also reward you more tickets. 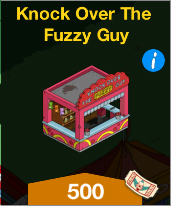 The Krusty-est Place on Earth Pt.12 - You have to place the Knock Over the Fuzzy Guy Stall [ 500] and make Marin try and knock over the Fuzzy Guy. The task takes 60 minutes [ 21 and 17] to complete and you will be awarded 20 and 10 for completion. The Krusty-est Place on Earth Pt.13 - Bart wants more excitement and Krustyland. 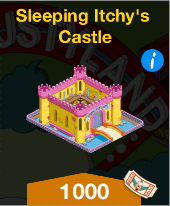 Krusty suggests that we build Sleeping Itchy's Castle which requires you to reach level 22 and costs 1000. You will be awarded 20 and 10 for completion. The Krusty-est Place on Earth Pt.14 - Make Krusty get serious for 8 hours [ 82 and 70]. You will be awarded 20 and 10 for completion. The Krusty-est Place on Earth Pt.15 - Homer thinks the Ring Toss game is rigged. Krusty wants to place Sideshow You for 1000, to prove he has changed his ways and runs a legitimate establishment. 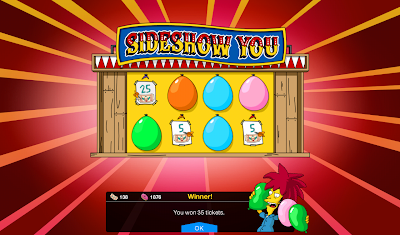 You can play the Balloon Pop game at the Sideshow you and earn free tickets to use at Krustyland. 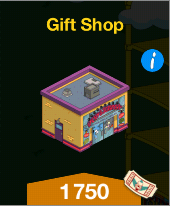 The Krusty-est Place on Earth Pt.16 - Reach level 23 and build the Gift Shop for 1000. It will take you 24 hours to complete. You will be awarded 20 and 10 for completion. The Krusty-est Place on Earth Pt.17 - Make Comic Book Guy visit the Gift Shop for 60 minutes [ 21 and 17]. You will be awarded 20 and 10 for completion. The Krusty-est Place on Earth Pt.18 - Place three garbage bins at 100 each. You will be awarded 20 and 10 for completion. 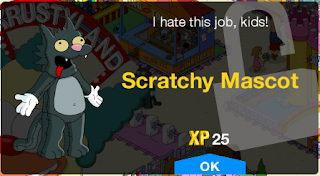 You will be informed that Wiggum, Moleman and Squeaky-Voice Teen will appear in Krustyland when they don't have tasks in Springfield. The Krusty-est Place on Earth Pt.19 - Make Wiggum collect Krustyland bribes for 4 hours [ 52 and 45]. You will be awarded 20 and 10 for completion. 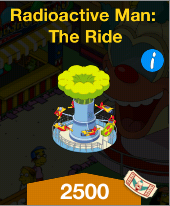 The Krusty-est Place on Earth Pt.21 - Reach Level 24 and build Radioactive Man: The Ride. It will costs 2500 to build. You will be awarded 20 and 10 for completion. 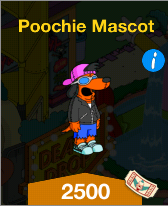 The Krusty-est Place on Earth Pt.23 - Hire a Krustyland Mascot - Poochie is the only mascot you can purchase for tickets ( 2500 to be exact). 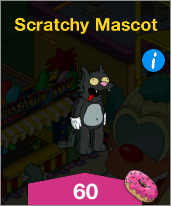 If you have some extra doughnuts you could consider purchasing the Itchy ( 60) or Scratchy ( 60) mascots too. 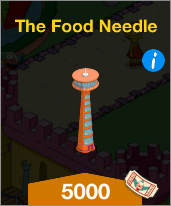 The Krusty-est Place on Earth Pt.24 - Reach level 25 if you haven't already and build the Food Needle for 5000. The building will take 1 day and 12 hours to complete ( 1000). The Krusty-est Place on Earth Pt.25 - Make Comic Book Guy eat at the Food Needle. The task takes 12 hours ( 126 1000) and you will be awarded 20 and 10 for completion. 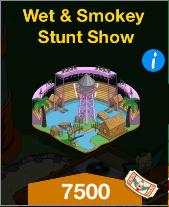 The Krusty-est Place on Earth Pt.26 - You have to reach level 26 and build the Wet-and-Smokey stunt show for 7500. You will be awarded 20 and 10 for completion. 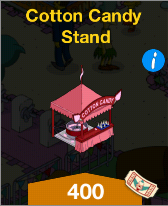 The Krusty-est Place on Earth Pt.28 - Get a cotton candy stand for 400. You will be awarded 20 and 10 for completion. 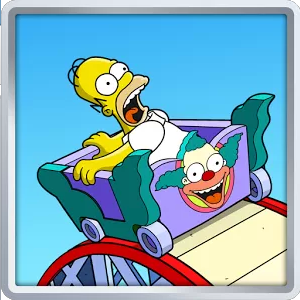 Lisa says the haunted house wont be available in Krustyland until level 150. Nelson decides to bully the game into letting us get faster access to it. 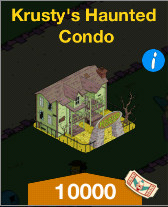 The Krusty-est Place on Earth Pt.29 - Build Krusty's Haunted Condo for 10000. The building takes 24 hours to complete and you will be awarded 20 and 10 on completion. You will be awarded 20 and 10 on completion. 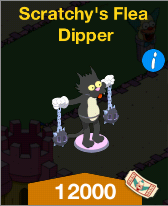 The Krusty-est Place on Earth Pt.31 - Reach level 27 and build Scratchy's Flea Dipper. It will cost you 12000 and will take 1 day and 12 hours to complete. You will be awarded 20 and 10 on completion. The Krusty-est Place on Earth Pt.32 - Nelson wants to try out the Flea Dipper and doesn't want Lisa to follow him. Lisa asks Nelson if he is breaking up with her, to which he replies that he doesn't want to be "wussified". 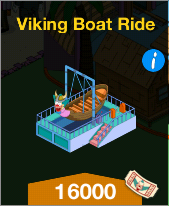 The Krusty-est Place on Earth Pt.33 - Reach level 28 and build the Viking boat ( 16000) which will take 24 hours to complete. You will be awarded 3200 along with 20 and 10 on completion. The Krusty-est Place on Earth Pt.34 - Krusty wants Carl Carlson to ride the viking boat, now that it has been built. You will be awarded an additional 20 and 10 on completion. The Krusty-est Place on Earth Pt.35 - Carl asks Krusty what he has against adding a vegetarian menu at Krustyland. Krusty assures them that there are vegetarian menus to be found. 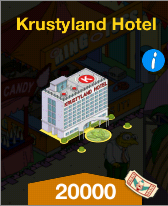 The Krusty-est Place on Earth Pt.36 - Build the Krustyland Hotel for 20000. You will be awarded 4000 and an additional 20 and 10 on completion. You will be awarded 4000 and an additional 20 and 10 on completion. 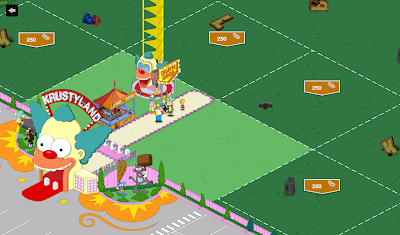 The Krusty-est Place on Earth Pt.38 - Reach Level 29 and build the Duff Pavilion for 25000. It will take 1 day and 12 hours to complete and you will be awarded an additional 20 and 10 on completion. 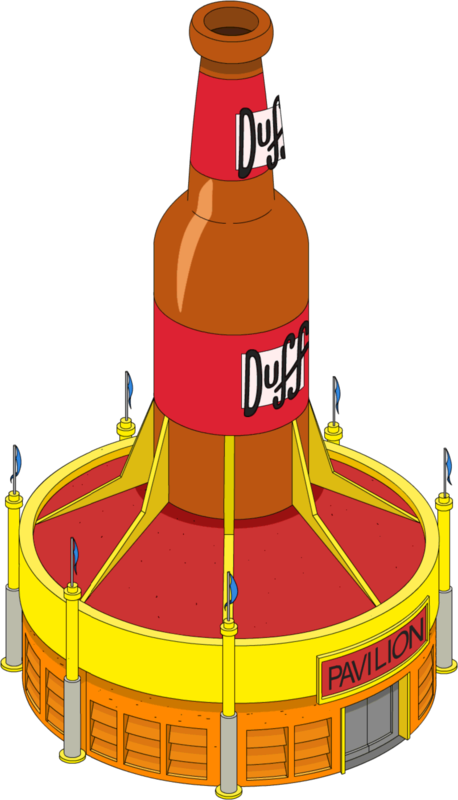 The Krusty-est Place on Earth Pt.39 - Make Homer visit the the Duff Pavilion for 60 minutes. You will be awarded 4000 and an additional 20 and 10 on completion. The Krusty-est Place on Earth Pt.40 - Build the Tooth Chipper for 32000. It will take 5 days to complete and you will be awarded an additional 20 and 10 on completion. The Krusty-est Place on Earth Pt.41 - Make Bart ride the Tooth Chipper for 24 hours. You will be awarded an additional 20 and 10 on completion.